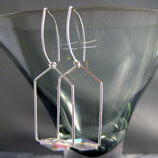 Since men have first been able to make glass, they’ve been making glass jewelry and decorative glassware. Perhaps the strongest evidence of this are the relics left behind by the Phoenicians, who brought glassmaking to the Hellenic culture. The Romans then assimilated these skills when they brought Phoenician and Hellenic slaves back to Rome. After the Roman Empire fell, the Venetian Republic rose, and it was here that the great tradition of glassmaking lived on as Western Europe spiraled into the Dark Ages. When Constantinople fell in 1204, many of the world’s greatest glassworkers fled to what is now Italy. Many historians believe that this was one of the key trigger events for the Renaissance period. Nearly one-hundred years later, the Grand Council of Venice ordered all glassworkers to move out of the city to the nearby island Murano. They made the move to protect the city against fires from furnaces and kilns, but there is also evidence to suggest that this was a calculated move to dominate trade. And that is exactly what occurred. Murano became the glass epicenter of the world. Murano glassmakers rose to prominence within the culture, one of the few non-nobles able to wear swords and mix with the nobility. They were not, however, able to leave the city. Through this monopoly, Venice achieved dominance that lasted until the 17th century, and during that time, Murano glass jewelry became renowned throughout the world for its perfection. But Venice could not prevent all the glassworkers from leaving. Over time, they made their way to countries throughout Western Europe. And when those countries, such as England, Holland, Portugal and Spain, began to establish colonies throughout the world, they distributed those glassmakers as well. Venice quickly began to lose its dominance. In 1797, Italy lost its independence to the occupation of Napoleon Bonaparte. One side effect of this occupation was the dismantling of the glassmaking guilds. Another was the steep taxes placed on Murano glass jewelry and other glassware meant to favor Bohemian glass. It worked. Murano glass disappeared from world markets, and Murano glassmaking nearly disappeared completely. The modern Italian Republic formed in 1861, and like the Phoenix rising from the ashes, Murano glassmaking experienced an immediate rebirth. The Italian economy soon flourished, and as Italian merchants began to bring their wares to Paris, they rekindled interest in Murano glass jewelry. Since then, Murano glass has continued to thrive. Today, the island of Murano is a special place nearly untouched by time. There are no vehicles, and visitors come by boat. The glassmaking is as it was all those years ago, and that allows for glass that is unlike the glass available anywhere else in the world. 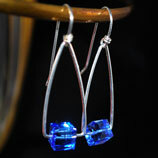 The bad news is that Murano glass jewelry is not easy to come by. 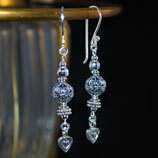 One of the few places online specializing in Murano glass jewelry is at Genuine Bijoux. 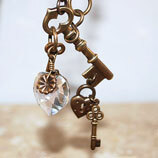 They offer a full range of Murano glass items including art, jewelry, necklaces and pendants. Those who love Murano glass jewelry owe it to themselves to come examine this amazing selection. 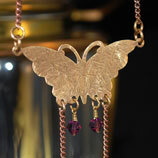 One of their finest pieces is the breathtaking solid brass butterfly and Murano Heart necklace. 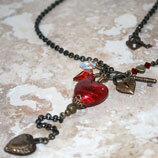 Another is the solid brass necklace with a red gold-foil Murano heart.